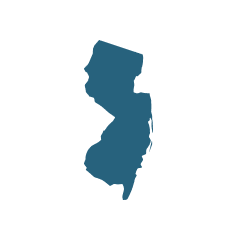 Since its founding, New Jersey has been a largely industrial state, and the state's dependence on factory production increased in the Industrial Revolution. Emerging industries such as textiles, electric power plants and iron mining overtook agricultural jobs. Many New Jersey residents found employment in these occupations, where asbestos exposure was a major threat. Cities such as Paterson and Trenton expanded the most, developing many new factories to produce electrical equipment, processed food and chemicals. As the most densely populated state in the nation, New Jersey also ranked eighth nationally for the most deaths from mesothelioma and asbestosis from 2012 to 2013. Many of New Jersey’s prominent industries, including chemical development, textile manufacturing, shipping and railroad development exposed workers to large quantities of toxic asbestos. Sixteen of the state’s thriving manufacturing plants employed over 102,700 individuals and the eight shipyards in New Jersey employed 376,200 workers. These people often encountered asbestos in the walls or machinery in their workplace. Employees of oil, power and chemical plants also faced the risk of asbestos exposure at their workplaces. One study published in the American Journal of Public Health suggested that as many as 486,400 individuals had been substantially exposed to asbestos in New Jersey workplaces since World War II began. Get help connecting with Dr. Conway and find the treatment that's best for you. Johns Manville Products Corporation opened its first insulation plant in central New Jersey in the early 1900s. The company, which provided millions of dollars to industrial development, became one of the most notorious names in asbestos litigation. Johns Manville officials knew about the toxicity of asbestos as early as the 1930s, but they continued to use the inexpensive mineral in the company’s products for the next 50 years. Under the pressure of numerous legal cases, the company filed for Chapter 11 bankruptcy in 1982. Six years later, the company completely ended its asbestos lines and developed a settlement trust to deal with the future health claims of former injured employees. Redevelopment of the former Johns Manville facility – including proper asbestos abatement – was a key platform of Angelo Corradino, a mayoral candidate for Manville, New Jersey, in 2011. Corradino was elected mayor of Manville in 2014. In 1925, the National Gypsum Company developed asbestos-containing wallboard. The company purchased an Abestone asbestos cement plant in Millington, New Jersey in 1954, where it manufactured asbestos cement that contained up to 15 percent asbestos. In 1980, the company went bankrupt dealing with the numerous lawsuits filed by former employees who developed illnesses from exposure at the site. National Gypsum improperly delivered much of its waste to the Millington asbestos dumps on New Vernon Road and White Bridge Road, leading to site contamination that was addressed in the early 1990s. The company entered into an administrative agreement with the U.S. Environmental Protection Agency in 1985 to ensure ongoing site studies and cleanup processes. The W.R. Grace vermiculite mine in Libby, Montana, was the world’s leading producer of vermiculite, exporting hundreds of thousands of tons of asbestos-contaminated product to refineries across the nation. Seven refineries in New Jersey received vermiculite from the Libby mine, exposing workers to the fibers as they “puffed” the mineral into its usable form. W.R. Grace’s Zonolite facility at 15 Industrial Drive in Hamilton Township began processing Libby’s vermiculite in 1948. Approximately 100,000 tons of asbestos-laden vermiculite was refined at the facility, which possessed the state’s only heat expansion equipment. The process of “exfoliating” vermiculite through heat exposure was one of the most dangerous steps of refining, releasing high amounts of asbestos into the air as the vermiculite was “popped.” This facility was named a Superfund site by the EPA and cleanup efforts were launched in 2006. These seven facilities processed over 2,500 shipments from Libby, totaling more than 338,000 tons of vermiculite. A.O. Polymer produced compounds such as plastics, resins and special polymers between the 1960s and 1993. In the 1970s, the facility was cited for numerous health violations, including improper disposal of wastewater, contamination of local drinking water and 13 air quality violations. During the 1981 cleanup efforts, 61 cubic yards of asbestos material was removed from the four-acre site. Many buildings in New Jersey still contain asbestos. Renovating these structures could cause construction workers and area residents to inhale asbestos. Some of these buildings are abandoned, such as a former psychiatric facility, and anyone who explores the empty buildings is at risk of asbestos exposure. Former employees of Johns Manville, National Gypsum and other leading asbestos companies in New Jersey faced frequent workplace exposures to asbestos. They often brought microscopic fibers home, unknowingly exposing their family members. New Jersey families affected by asbestos have filed lawsuits to seek compensation for resulting asbestos-related illnesses and wrongful deaths. In July 2014, a New Brunswick judge awarded $90.5 million to 11 families from Manville, a New Jersey town named after Johns Manville. Several of the victims who developed asbestos-related cancer never worked at the Manville plant but had family members who did. The awards ranged from $4 million for Virginia Stanley, whose father was also a victim named in the lawsuit, to $15 million for John Ketchum, whose wife died in 2009 at age 49. The families received compensation from Anova Holding, AG, and Becon, AG, two Swiss companies that supplied asbestos to Johns Manville from the 1950s to the 1980s. Decades earlier, in 1982, Johns Manville and the Metropolitan Life Insurance Company paid $15.5 million to 683 former employees of the Raybestos-Manhattan Company of Passaic. The majority of the workers suffered from asbestosis, an incurable and progressive pulmonary disease. In 2006, Anthony Olivo sought compensation for his wife’s death from mesothelioma and a noncancerous illness he developed after decades of occupational exposure to asbestos. Olivo, a former steamfitter and welder, worked at various industrial and commercial job sites in New Jersey from 1947 to 1984. Olivo’s wife developed mesothelioma because she washed his asbestos-contaminated work clothes. The lawsuit named 32 companies that manufactured, supplied or exposed Olivo to asbestos products including National Gypsum Company, W.R. Grace & Co., Exxon Mobil Corporation, Texaco and Owens-Illinois. All defendants, with the exception of Exxon Mobil, settled with Olivo out of court for undisclosed amounts. In April 2018, a multimillion-dollar verdict was awarded to a plaintiff alleging J&J’s talcum-based Baby Powder caused him to develop cancer. A court in New Brunswick, New Jersey, awarded $117 million to Stephen Lanzo III and his wife. Lanzo claimed he developed mesothelioma as a result of exposure to J&J’s asbestos-contaminated talcum powder. The verdict included $36.1 million from Imerys SA, the company that supplied J&J’s talc.